We welcome a guest post from our former chair, Peter Roberts, who gave this Presentment in this month’s Verderers Court. Ashurst workhouse from the west c.1907. My name is Peter Roberts. I am a former Verderer and a former resident of Ashurst. Yesterday the National Park Authority published their Plan Amendments which includes the use of of land at Ashurst for housing. This land is the former Workhouse Site, which was taken from the open Forest in 1836. When the grant for the land was made there was a specific reservation that in the event of the workhouse no longer being required it should revert to the Forest. Seven acres of the site were returned to the Forest in 1988, thanks mainly to the work of the late Verderer David Stagg. The remaining land is commonable land from which the common rights have never been removed. It should be returned to the open Forest for grazing for the commoners stock. I implore you to object most strongly to the National Park Proposed Main Modifications and work towards returning this land to the rightful users. The grant was made on 31st December 1836 and may be found in the Wood Lease Books now held by the Forestry Commission in Queen’s House (Vol 4 pp 279-285). The original is at Kew: NRA ‘Grants of land for Workhouse 1836-1915’, F10/52 4079/1. We thank Peter for permission to share this Presentment, and his notes. For the 150th Anniversary of the New Forest Association (aka Friends of the New Forest) he wrote our history in Saving the New Forest. At last month’s court, in a short, off the cuff, two sentence presentment, one of our trustees similarly urged the Verderers to assert the Forest’s rights to the land in question. Our planning committee had made a representation to the New Forest National Park Local Plan Inspectors regarding the site. Notes from both Peter Roberts and Richard Reeves regarding the site were shared privately with the Verderers at that time. New Forest Local Plan Modifications are open to consultation until 31st May 2019. More information, including the additional Ashurst Workhouse allocation, which does NOT recognize nor even mentions the Forest rights of the portion not returned to the Forest, may be found here. New Forest District Council’s Local Plan aims to build 10,500 homes over ten years. In their own summary they admit this is 3 to 4 times their current development rate. 13 of 20 of their proposed strategic development sites are on Green Belt. This will increase the population in the district and park by roughly 7 times that of Lyndhurst. One of these “Lyndhurst”s will be an entire new village at Fawley, which will increase the population of the park by 10 %, at the wrong end of the already stressed A326 transport corridor. This would have a severe recreational impact on the Forest with disturbance to habitat and livestock, and would further urbanize the already saturated Waterside Area, requiring upgrades to the roads that due to that saturation would necessarily encroach onto the highly protected Crown Lands within the National Park, and would increase traffic westward across the Park on roads already animal accident blackspots. The National Park is failing its statutory purposes to conserve and enhance by adopting the poor logic and questionable feasibility behind the NFDC support for the Waterside development, and lack of objection to the scale of NFDC’s 10,500 home plan. The Park Authority and District Council should be working together to fulfil their legal obligation to protect the Forest, not to undermine that protection for the sake of NFDC’s political objectives. The Friends of the New Forest / NFA are objecting to the NFNPA Local Plan under examination in November, before your next court, because if accepted as it is, it lays the groundwork for NFDC’s Local Plan which presumes the need and scale of the NFDC objectives, including the destruction of Tom Tiddler’s Ground. The Government 25 Year Environment Plan promises greater protection for National Parks and both designated and undesignated habitats, and a review for possible expansion of the boundaries of National Parks. The Park’s own policy should only allow major development under exceptional circumstances. 10,500 homes in the ostensible buffer around the Park, the intentional destruction of Important habitat, and the decimation of Green Belt flies in the face of any presumption that the National Park provides the Forest with any protection. We ask the Verderers, in their role as a statutory consultee to support our objections, particularly when the NFDC Local Plan is considered. This is a generational threat to the Forest, and hope that all present in both official and private capacities will join us in this fight. Indeed previous attempts to do just that failed only due to unreasonable demands from the Power Station management. The current proposals range from 1500 homes on both the site and onto the SP25 land, or 4000 homes on the site alone (that profitability in the viability study equates 120 homes on the Park’s area with 2500 homes difference, is an example of the nonsense that the viability study purports, and a veiled threat to make an even more unacceptable development). Even within the Power Station site, the proposals are not limited as they should be to just the former industrial area. There is also an entirely cracked logic that if these homes must be built to fund the Power Station site development, that they must be built there, and not anywhere else in the country, and they must be built first, but with no guarantee that the industrial site would be developed subsequently. The current proposals for the Power Station site, which do not demonstrate exceptional circumstances required for major development within the Park, should either be abandoned, scaled down to minor settlement, or mixed use for recreation or perhaps most fittingly for its industrial heritage sustainable power generation in the form of a solar array, all of which should be confined wholly to the industrial area alone, and outside the 400m zone of any future and very likely SPA designation. Here Planning and Transport Chair, Graham Baker weighs in, with some frustrations, over the past year, full of mounting concerns of increased pressure on the Forest. Part of our series of Annual Reports relevant to our AGM on Saturday 21st April 2018. It is difficult to read the 2016 planning report and not to conclude that 2017 has been a largely wasted year. You will therefore excuse any frustrations that show. There remains little between our Association and the National Park Authority (NPA) over individual planning applications. In the defined villages we are succeeding in coping with the need to increase central housing densities without disturbing the spacious nature elsewhere and coping with the reduction in retail outlets without losing the vitality of High Streets. Residents agree that the type of housing required is modest, suitable for younger people starting out and older people downsizing. But we are challenged by developers’ desire to build what is most profitable without regard to local need; currently this is managed flats for old people who can afford high charges. Second home ownership and short-term letting are growing at a rate that could exceed the planned increase in housing numbers. This sometimes requires planning permission and it is always worth knowing the extent of the problem, so please let us know if it happening near to you. In the countryside problems remain dispersed but accumulatively erode character and traditions. Commoning properties are sold to the extremely well off who then seek to convert their humble holding into something else. Extensions are maximised, tatty outbuildings are replaced by three car garages with fully equipped offices above, large loose boxes are replaced by a row of pretty stables, ménages replace a pleasing adjacent paddock and elaborate electric gates or cattle grids replace five bars. Any common grazing land owned outside the new fence is “tidied” – this usually means easing the entry of the Land Rover Evoque by dumping tonnes of gravel on common grazing land. Often these activities do not break planning rules. Where it does we seeks first to have the applicant reconsider and secondly seek refusal. Discussions continue on the revised Local Plans of the National Park and NFDC. We have achieved protection for the NF Special Protection Area broadly similar to that of the Thames Basin Heaths. This caused several proposed housing sites to be withdrawn, but rather than reduce numbers, NFNPA sought more sites, previously considered unsuitable, to keep the likely new dwelling numbers at around 35 per annum. The average house price in the Park is £581,000, over 15 times average earnings and there is a desperate need for affordable homes for local people. The NPA recognise the problem but their solutions lack ambition. We believe a straightforward policy that all new housing should be affordable stands the best chance of resisting incessant government meddling and developer manipulation and that the NPA should accept a greater role in securing underutilised publicly owned land in the villages for development. Since we have become a National Park, the NPA’s own data reports that the success of many species of ground and low nesting birds has suffered a “marked decline”. The universally agreed cause is disturbance from recreation and the extra dwellings being built around the New Forest will result in an additional million visitors per annum, considerably worsening the problem. Despite this it is difficult to find any action stemming from the NPA’s 75 page Recreational Management Strategy since its publication in 2010. The planning committee will do all it can to ensure the emerging Local Plans recognise recreational pressure on the National Park as the primary problem facing the New Forest and that compensation from developers is used in forthright measures to reverse the problem. The relocation or closure Forestry Commission car parks will be one of the most effective management tools in reducing disturbance and we have developed sophisticated mapping techniques to measure levels of disturbance from them. In 2017, planning volunteers have scrutinised over 1,000 planning applications, responded to a dozen consultations, developed maps, maintained good relationships with the parishes, plotted aircraft routes and surveyed overhead cable routes (with some success the line south and west of Burley is to be buried in 2018). Our thanks go to them all. NFA’s objection can be seen in full here. Comments covered extent of previously developed land (pdl) on site, proximity to New Forest Special Protection Area, lack of affordable housing and housing type. NFA comments can be seen here. Comments concentrate on principle of no gain from unauthorised-use dwellings and the type of dwelling proposed. The perennial threat of development of Dibden Bay by Associated British Ports (ABP) for a container port appears to be back on the table according to stories yesterday from both the BBC and the Southampton Daily Echo, with ABP complaining of limited capacity and Chancellor of the Exchequer, Phillip Hammond saying he would support the development which would no longer be subject to a local planning inquiry, but would be considered a National Infrastructure Project. The harmful impacts to wildlife and to the landscape of the New Forest that would be caused by developing Dibden Bay as a container port would be no less today, tomorrow or in the coming decade than they would have been in 2004 when a lengthy planning inquiry led to the rejection of a similar proposal. The one thing of major significance to have happened since then has been the designation of the New Forest National Park, recognising that in addition to its massive importance for habitats and wildlife the New Forest is one of ‘the finest landscapes in England’. Government national planning policy emphasises the great weight that should be given to conserving the landscape and scenic beauty of National Parks. Dibden Bay is immediately adjacent to the boundary of the New Forest National Park. There is no hinterland, no buffer zone. At present on one side of this line there is Forest heathland and trees and on the other the environmentally important marsh and reclaimed land of Dibden Bay. Apart from the destruction of valuable habitat, a container port would bring vast cranes reaching far into the sky, 24 hour intensive lighting and greatly increased traffic not just from transporting containers but serving all of the ancillary activity that would spill out across surrounding areas. The west side of Southampton Water is already a busy area jostling against the fragile special qualities of the New Forest. It is no place for further major development. With the Government taking the decision on fracking away from Lancashire County Council on 6th October 2016, this brief review of our position and the possibility of hydraulic fracturing in this region could be of use. The NFA support the position of the Campaign For National Parks, that fracking in or under our National Parks has significant environmental impacts – polluting groundwater, damaging the landscape and ruining tranquility, and is inappropriate for the setting. While we’ve been given to understand that the New Forest’s geology would not be attractive to fracking, we do not want to see this for any of our National Parks or other protected areas. Additionally the precedent it establishes for putting supposed infrastructure demands over these designations is truly chilling. 33 years ago an application by Shell UK to drill for oil and gas in Denny Inclosure was seen off, a battle we shouldn’t have to fight all over again. Last year, when the Government was in the midst of its U-Turn on a promise not to license fracking in National Parks (eventually arriving at the position that they would allow drilling from just outside National Parks to go under them), Durham University published an article ranking the Parks likelihood for hydraulic fracturing. A relatively young geology and the rocks close to the surface have no shale gas, shale oil, or coal bed methane potential. 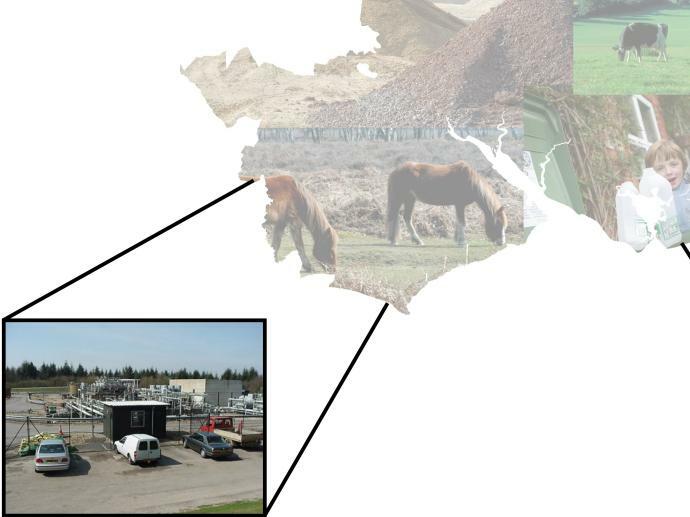 Oil and gas have been found in rocks beneath areas close to the New Forest, and there has been exploration in the national park, but there is no evidence of any oil- or gas-bearing shales that would be of interest to fracking companies. The Briefing Note puts the Forest in its middle Amber (fracking unlikely) category (along with Brecon Beacons, Exmoor, and Northumberland). It listed four national parks as Red (fracking possible): North York Moors, Peak District, South Downs, and Yorkshire Dales (rocks of possible interest to companies looking to frack for shale gas, shale oil, or coalbed methane). Mrs Westerhoff attended the meeting on behalf of the Court. The discussion centred around fracking. Two areas have been identified as potential sites, one being The Weald (as far west as Winchester) and the other is in Dorset reaching east to Thorney Hill adjacent to the New Forest. Whilst the New Forest could be fracked in the future, Mrs Westerhoff understood it would only happen under exceptional circumstances and would be subject to the European legislation protecting the SAC. With the unknown shape of the Brexit plan, the reassurance of protection from the SAC (Special Area of Conservation, a European designation), is under threat unless those protections are formally and thoroughly back-stopped in UK legislation and policy. There are known oil and gas resources within Hampshire’s two National Parks and exploration already takes place within the South Downs National Park. There are other examples nationally of where oil and gas development takes place within designated areas. This includes western Europe’s largest oilfield at Wytch Farm, Dorset and sites in Surrey all of which are located within designated areas for nature conservation. The potential impact of a proposal on designations will be taken into account in detail at the planning application stage. The Government has recently announced new planning guidance on unconventional oil and gas development in areas of designation such as National Parks, AONBs and heritage sites (see question 23). There are also policies in the adopted Hampshire Minerals & Waste Plan in relation to minerals developments in designated areas (including Policy 4: Protection of the designated landscape) which will be used to guide whether planning permission should be given in such locations. In December 2015, there was a vote in the House of Commons regarding hydraulic fracturing in National Parks. MPs voted in favour of allowing hydraulic fracturing to take place 1,200 metres below National Parks and Sites of Special Scientific Interest, as long as the drilling (and associated infrastructure) takes place from outside the designated areas. There are no licences in the New Forest National Park administrative area. The Weald in the South Downs National Park is a target for fracking, and would be a potential testbed for the 1200 metre rule. In September 2016 their Authority rejected a plan for horizontal drilling with hydraulic fracturing. The applicant believes “this proposal would be supported by the Planning Inspectorate or the Secretary of State in the event of an appeal.” Given that the British Geological Survey (BGS) estimate 2.2 and 8.6 billion barrels of shale oil beneath the Weald Basin, that appeal could be in with a chance as that may be deemed nationally significant. We may need to lend our support to our neighbours should this go forward. The protected areas in which hydraulic fracturing will be prohibited have been set out through the Onshore Hydraulic Fracturing (Protected Areas) Regulations, which were formally approved by both Houses of Parliament in December 2015. These regulations ensure that the process of hydraulic fracturing cannot take place above 1200 metres in National Parks, the Broads, Areas of Outstanding Natural Beauty (AONBs), World Heritage Sites and areas that are most vulnerable to groundwater pollution. Rather than enabling operations in protected areas, these regulations introduce an additional protection to our most sensitive areas and complement the strong protections already provided by the planning system. Moreover, it is worth emphasising that the regulations do not in themselves grant any form of permission for “associated hydraulic fracturing” to take place under any of these sites. They simply establish the principle that hydraulic fracturing should be prohibited by legislation in the specified areas and down to the specified depth. A company looking to develop shale will still need to obtain all the necessary permissions, like planning and environmental permits – and any proposals will necessarily be subject to further detailed consideration and scrutiny under our legal and regulatory regimes. Orwellian newspeak at its finest “an additional protection to our most sensitive areas”, these sensitive areas would not need additional protection, if they weren’t under threat from this activity in the first place. They should simply be removed from the equation entirely. Putting an arbitrary depth of 1200 metres also ignores the fact that those 1200 metres (and the water table) will be drilled through to get to that level, that hole, however well engineered will be connected to the area into which fracking fluid will be pumped at high pressure. What could possibly go wrong? Fracking was temporarily suspended in 2011 after earthquakes were caused near Blackpool. The NFA discussed fracking issues at the November 2015 Council meeting, and although it is unlikely that the Forest’s geology would attract fracking per se, we’re completely against this approach both in principle, and the possibility that it would open the door to similar exploitation. These fights are perennial and ongoing. The protections offered to designated landscapes and habitats, National Parks and SSSI, et.al. must be honoured and remain meaningful. 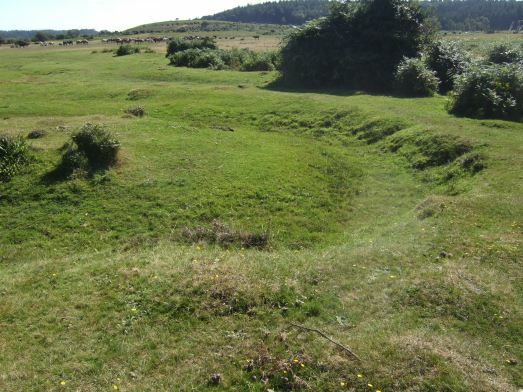 Buckland Rings is an Iron Age Hillfort (and modern day informal BMX track) situated on the National Park’s border with Lymington. To its south and east ran a 33v overhead cable which spoilt the setting of the fort from the adjacent open access. The cable has now been buried as part of Scottish and Southern Electricity Networks £15m project to underground 90km of overhead lines in AONB and National Parks in North Scotland and Central Southern England. A few weeks after the burial no evidence of the work can be seen on the ground. NFA are now championing the burying of the cable from Hicheslea west along the old Ringwood train line via Slap Bottom to Bagnam. If anyone out there has an overhead cable in the New Forest National Park they particularly dislike, they should should contact planning@newforestassociation.org. One concern I think we all share about the Latchmore Brook project is the transport of the infill materials. This is due to cause a certain amount disturbance and inconvenience to those residents and visitors along the delivery routes, as well as valid questions about the safety for both road and Forest users, man and beast. I’ve already had a private go at the FC and LUC over their need to provide concise and useful figures for the public to properly convey the size of the issue. Here I attempt a stop-gap. Movement of materials to the nine stockpiles to service nine different project areas is due to run over four different access routes in two or three of the four years of the overall project. Two of these access routes are via relatively well used roads, the B3078 Roger Penny Way from either Godshill or Brook to Telegraph Hill, and the turning from the A31 to Stony Cross, then the turning towards Slufters and Cadman’s Pool, followed by the turn towards HighCorner /Linwood, almost immediately turning off onto the Forest Track to Holly Hatch / Alderhill. The more problematic routes go through the village / cul de sac Fritham, home of the Royal Oak pub, which some consider the unofficial office of the NFA, the other through the village of South Gorley and Ogdens. As you drive northeast up the unnamed road towards Ogdens, many of the houses grow larger. You’ll pass Fir Tree Farm, one of the best placed and few remaining commercial stables on the Forest, its manège is only a fence and a few feet away from the narrow lane, riders in the school may not appreciate the extra challenge to their control and aid skills as their mounts react to passing tipper lorries. After the stables, the road becomes a forest track, with more modest dwellings fronting directly and quite closely to the road. Naturally we have every sympathy for those who may be effected. All the more reason to get at some realistic, and relate-able numbers. I’ve seen and heard alarming figures, 70HGV movements a day or 44000 HGVs over the course of the project, which I’ve discovered to be ridiculously overblown. Not that I blame anyone for getting this wrong as the planning documents do not lay out the information in a helpful way. I had to bounce around four or five of the submitted statements and appendices to pull this together. 1.3 The works are anticipated to last for approximately 4-12 weeks (July-September) per year over a period of 4 years. If weather conditions are poor (wet), works may halted temporarily to protect ground conditions. Ogdens – 25 HGVs and 4 tractor/trailer deliveries per day. Alderhill – 25 HGVs and 4 tractor/trailer deliveries per day. Fritham – 25 HGVs and 4 tractor/trailer deliveries per day. Telegraph Hill – 25 HGVs and 4 tractor/trailer deliveries per day. 4.10 In addition to the HGV movements set out above, there will be approximately six employees on site associated with the restoration works (i.e. total 12 movements per day). In two of the planning documents we are only given maximums or ranges, we’re told a maximum of 25 HGV deliveries per day per route, a window of 4-12 weeks in each of the four years, this last is the beginning of distortion as only the 2019 Phase is 12 weeks July to September the other three are 4-8 weeks August-September. Back to one of the numbers being bandied about by alarmists. 70 HGV’s per day. If someone has quoted this figure at you, they are either lying, or unknowingly passing on an intentional lie. The only way one could arrive at the number 70 is to take the maximum 25 HGV deliveries, the 4 tractor/trailer, plus up to 6 staff vehicles for a total of 35 roundtrips = 70 movements, only 50 movements are HGV (still not a small amount, but smaller, and a maximum, averages may be lower). As we’ll note later, despite the stated maximum of 4 tractor/trailer deliveries per day conjuring an equal level of traffic, the number bale deliveries becomes negligible very quickly. Here’s the initial information I pulled out of the “Appendix 4.1: Estimated Restoration Material Quantities and Transport Movements Data” (a diabolically poorly laid out document in which every 2 out of three tables has a single line, in some case, a single cell). The 22 separate tables are easily and more usefully aggregated into three tables, the first gives us Material Quantities, the primary information we need to derive the number of deliveries, the other two Maximum number of deliveries per day clay/gravel/hoggin and heather bales respectively (plus Delivery timescale for HGV loads). You’ll forgive the small size required to squeeze this in here. The more important summary tables that follow will be suitably legible. I have added four columns of calculations, number of both deliveries and days for each material. In each case all numbers are rounded up to the nearest whole number before being used as a factor in the next calculation. These are based on both the optimal 100% load capacity and the maximum number of deliveries per day, and so derive the minimum number of deliveries necessary for each location/phase/route of the project. Depending on your point of view, this is perhaps the best case scenario, the maximum amount of disruption each day, but the fewest number of days. If the lorry loads are always at fullest capacity, than the number of deliveries remains constant. That’s the minimum number of deliveries that would have to happen, you could have them in the fewest number of days if the maximum deliveries per day is reached, but more likely you may want to spread that pain. For a lesser case scenario, I tweaked numbers for HGV loads at 90% of Capacity, which would increase the number of deliveries required, and thus the number of days, and further increased the number of days by decreasing the maximum deliveries per day to 20. This makes for some useful comparisons. Heather Bales will by delivered by tractor/trailers with a capacity of 300 Bales per delivery. We’ve also been told there’s a maximum of 4 deliveries per route per day. It’s tempting to simply add that to the other numbers of daily deliveries, but the problem with that is that there are not that many deliveries of bales needed compared to the other infill materials. At maximum capacity, there would need to be 44 deliveries for the entire project, not per year, not per route, the whole bale of wax. If you were to spread those evenly by year by route that’s less than 3. I can’t conceive that 3 extra tractor trailers per YEAR would be noticeable on even the quietest routes. For our lesser case scenario, we run at ¾ full, and that ups the total deliveries to 58. For the purposes of the assessment it has been assumed that the heather bales will be transported from outside the catchment via the four routes listed below, thereby assessing a worst case scenario in terms of potential effects. However, it is more than likely that the heather bales will be harvested from within the open forest areas near to the Latchmore Catchment and public roads will not be needed to transport them to the areas of the proposed works. It is also important to note that some mitigation measures are already in the plan which include: The same drivers will be used, and will be made aware of the “possible pedestrians, cyclists and livestock in the carriageway”, there will be “speed restrictions for delivery vehicles;” – 15mph on the Forest gravel tracks, 5mph under the ordinary 20mph restriction under the byelaws, and “traffic management with radios on the Ogdens route” as well as term time restrictions for school run to local schools. For those concerned about the condition of their roads, there will be a survey of the local highway network before and after the restoration phase to identify and agree any remedial works reasonably attributable to the restoration activities. (Full list in ES Vol 3 Appendix 4.2 Construction Traffic Management Plan Section 5). We hope that this analysis goes a little way to giving a realistic scale to the potential problems. Even if some may still want to scare monger, at least they should have more realistic numbers. But we don’t want fear, we want sensible and proportional discussion. And no, we don’t expect that this solves any remaining concerns – whether or not conditions are placed on the planning application to suggest further mitigation, there may still be work needed by both the Forestry Commission and local residents to accommodate each other fairly. In a feat of both irony, and good timing thematically, the presenter met the five minute limit for Presentments, and was cut short. The first part was an apology from the New Forest Association for not displaying our support for the Latchmore project “often enough, publicly enough, or possibly well enough.” allowing snide comments and poor treatment of the Verderers, Forestry Commission and National Park Authority to stand. The second part shifts emphasis to addressing areas that concern all of us about the project, Wildlife, Material Delivery Routes and Beauty. …I won’t make up for lost time now. I have a critique of more than ten errors on just one of their webpages which I’ve sent separately to the Verderers (on our news page). But I beg the courts indulgence to address a few points. Amongst the more emotive subjects, the potential disturbance to and loss of wildlife in the implementation itself. Of course this is of concern, but there’s a reason why we view the end-of-days prognostication of those opposed as baseless conjecture. 2119. Two thousand One Hundred and Nineteen. This is the non-exclusive number of completed River Restoration projects in the UK since 1994 listed in the database of the River Restoration Centre. Some smaller, some larger: the Cumbria River Restoration Strategy (CRRS) a partnership project between Natural England, the Environment Agency and the Rivers Trusts of Eden, West Cumbria and South Cumbria won the 2016 UK River Prize. They restored 14 km of river across the three catchments to a more natural form. Not all restore meanders, only 1593 had Habitat objectives, some were done for Flood Risk, Fisheries, etc. 120 are listed as a result of Community Demand. But all would have had the issue of disturbance to wildlife. Projects including hundreds of Rivers Trusts, Catchment Partnerships, private estates, the Royal Parks, the National Trust, amongst others. When the RSPB, and the Wildlife Trusts, and their ecologists support the Latchmore Brook project and other Forest wetland restorations, they do so with their experience, including many projects on the land they manage. If the consequences, in 22 years and 2119 projects, were as dire as the leaders of the opposition contend, I should think we’d have heard about it by now, or certainly their researches would have brought this to our attention. We do all share concerns about the project. The New Forest History and Archaeology Group have raised issues with the survey, we believe they are surmountable and encourage all interested parties to work towards a solution. Movement of materials to the site may cause disturbance and inconvenience to those along the delivery routes. I’ve seen and heard alarming figures, 70HGV movements a day or 44000 HGVs, which I’ve discovered to be ridiculously overblown. Not that I blame anyone for getting this wrong as the planning documents do not lay out the information in a helpful way. I’ve already had a private go at the FC and LUC over their need to provide concise and useful figures for the public to properly convey the size of the issue. The route through Ogdens, for example, we’ve been told this will be used in three years of the project, which is worrying, but hazard a guess at how many days would be necessary for deliveries through Ogdens in 2017 – 6, 2018 – 1, that’s right in 2018 they only need to make approx 7 deliveries on that route that year, 2020 – 28, of course that will bear more discussion, but it brings perspective. For the entire project all routes all years combined there will be fewer than 10k HGV movements, fewer than 11k in the worst case scenario we’ve run. I’ll be putting up our numbers on our newspage later today, available to all, even if you want to scare people with numbers at least you can use realistic figures. Finally, many are rightfully concerned about the future beauty of the Latchmore Brook. Walking along Latchmore Shade, you will clearly see the original meanders. In some cases you will see this as gently undulating curves written as a gentle scar in the landscape, it is easy to imagine a pleasant stream flowing along this course. Elsewhere the meanders have been eroded into unattractive ruts, and in other places the area between the current water course and the meanders become a quagmire when the drains rush water into the area, the flood in the now dysfunctional flood plain is partially contained by the meander, not allowing much onto the adjacent grazing. Fixing this will not make the area any less beautiful. I spoke of the prizewinning project in Cumbria, which we may begrudgingly agree is also an iconic landscape. That project was twice the size of Latchmore. Look at Warwickslade Cutting and Fletchers Thorns amongst many of the completed restorations which have bedded in, they look absolutely lovely now. There are many to choose from, but don’t impatiently show up moments after the diggers left and expect an instantaneous transformation. Give nature time to do its magic. After all nature took its time creating those meanders before they were ruined. While this second part was not read in the open court, the full presentment was distributed in written form to the Verderers, as well as the Annotated Fact Check of the Latchmore Crowdfunding Page. Much of this half of the Presentment was repurposed in the Public Questions section of the subsequent National Park Authority meeting, with an emphasis on addressing the PR problem now faced by Wetland Restorations in the wake of the leaders of the opposition to Latchmore’s concerted campaign of misinformation, misrepresentation, hyperbole and pseudoscience. Error: Error validating access token: Session has expired on Sunday, 10-Mar-19 01:16:56 PST. The current time is Wednesday, 24-Apr-19 23:25:12 PDT. © 2016 Friends of the New Forest.